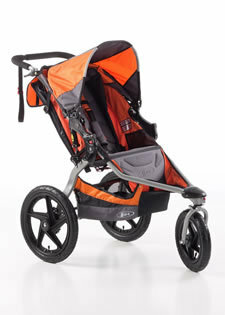 This is the summary of consumer reviews for Schwinn Free Runner Jogging Stroller. The BoolPool rating for this product is Very Good, with 4.10 stars, and the price range is $150-$220. 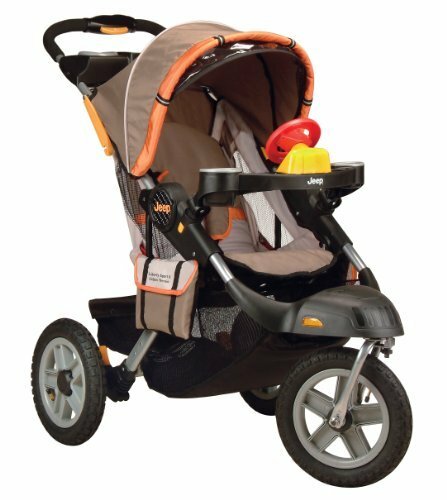 Schwinn Free Runner Jogging Stroller is designed to provide comfortable ride to kids while parents stay active with a jogging stroller that can go anywhere. 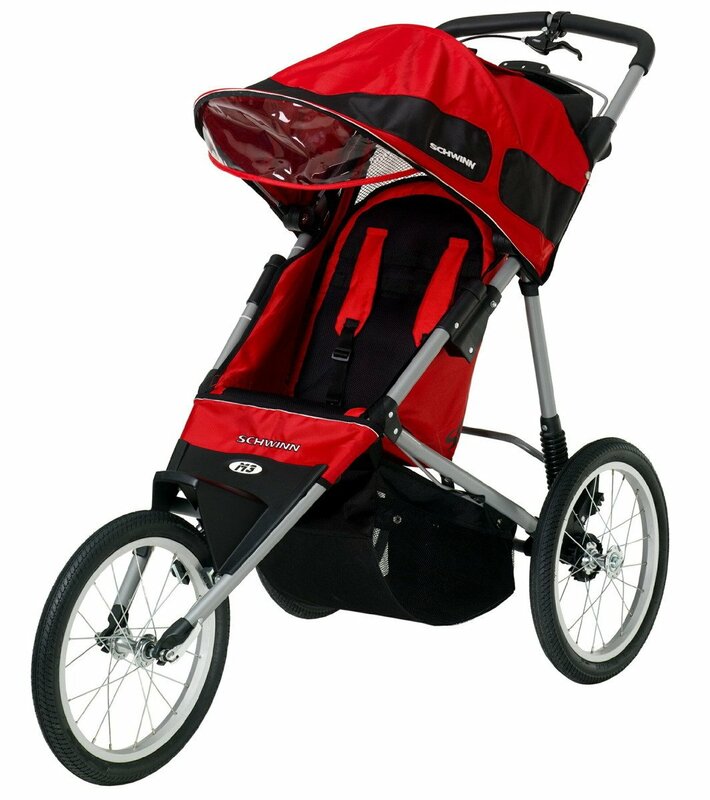 The Free Runner Stroller from Schwinn is equipped with large, 16-inch wheels and locked front wheel making it well suited for brisk runs on mixed and uneven terrain. It is easy to assemble, fold up and store. The front wheel is very easy to remove with a quick release system for compact folding. An adjustable push handle and big wheels makes it easy to push. It comes with a hand brake on the handle and rear parking brakes for additional safety. The aluminum frame is lightweight, rustproof and durable. The Free Runner features padded reclining seat, a five-point harness system, and an airy, vented cabin with adjustable sunshade to keep kids comfortable and happy as they ride. Additional convenient details on this Schwinn jogger include a parent tray that holds a cell phone, drink, and keys, pockets for snacks and drinks, and behind-and-under seat storage bins. Some parents complain about the flimsy cords and strap system to adjust the seat. The cords may come loose and cause safety issues. In some use cases, stroller tends to veer in one direction and does not go straight. The front wheel needs a proper adjustment. 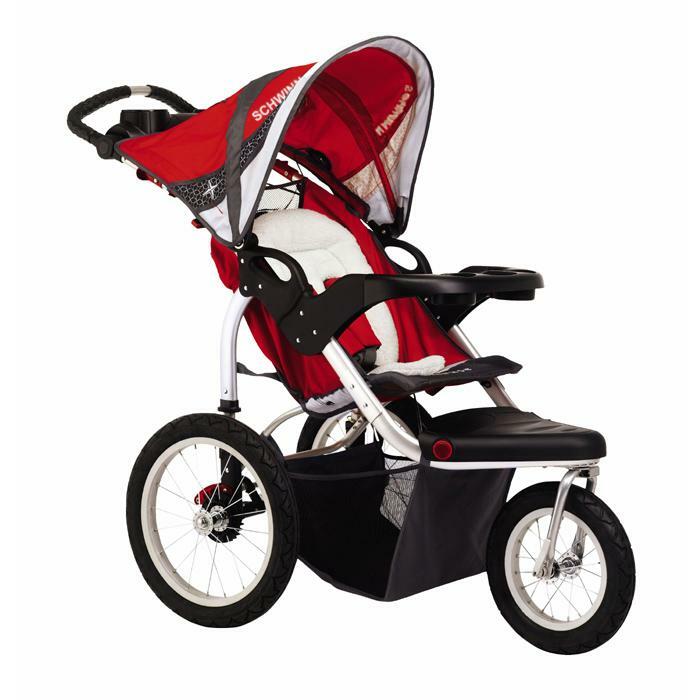 Overall, Schwinn Free Runner Jogging Stroller offers many of the advantages of a jogging stroller at a very affordable price. 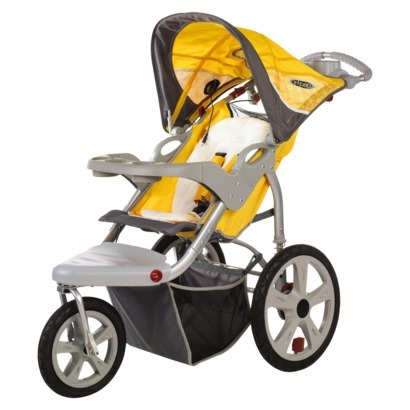 It is durable, lightweight and provides a smooth ride to kids. Parents recommend this stroller and they rate it well for its good performance. It comes in 3 colors- Light Blue, Blue and Red. Easy to remove front wheel and collapse. Nice wheels and big canopy. I saw some reviews talking about the fixed position front wheel. I ended up taking off the front wheel and re-installing it for better brake pad alignment. On the downside, my brake doesn't work & no matter how many times I adjust the front wheel I can't get the alignment straight. I wish it'd a wheel that'd turn in the front. It doesn't fold together neatly because the wheels are large and the front wheel doesn't swivel. The adjustable push handle is nice. It moves smoothly and is easy to push.The front wheel only goes straight which can make is hard to use on a curvy trail. Our daughter always seems comfortable, falling asleep during most outings. It's very comfortable for my 5'1" daughter to jog behind due to the adjustable handle. My daughter is comfortable, it's very lightweight, it handles smoothly and the canopy is nice and big to fully cover your child. My daughter is 10 months old and fits perfectly. It maneuvers easily and my 2 year old daughter is comfortable in it. 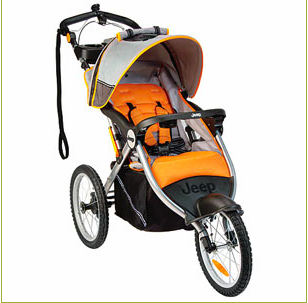 The stroller rides very smoothly and both the kids seem comfortable in the stroller. It lasted until summer 2010 with our third daughter in it. Overall this Free Runner does as it says it'll and provides a comfortabel ride for daughter #3. The thing I love the most is the adjustable stroller handle. The big adjustable canopy is very nice to keep the sun out of their face and also to use when it's windy. My baby loves this stroller seat, and is very securely fastened. My biggest disappoinment was the seat adjustment, the strap wasn't sturdy and secure enought to keep baby upright. 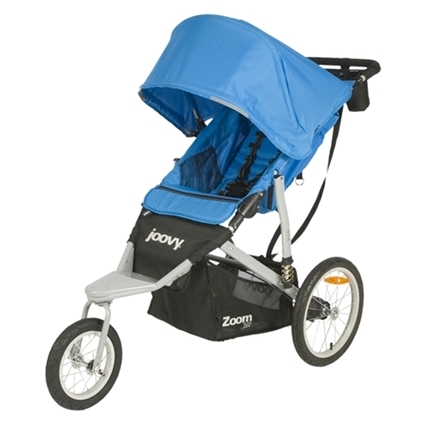 Baby has slept in it during runs and the sun shade is able to be adjusted to lots of angles. - Seat angle is kind of steep for small babies. Easy to push, light weight and great sun visor. When we went over a bump (during my jog) the cord slipped off, the seat reclined all the way down and my baby girl's head got caught on the cord, basically dangling her head. It's a smooth ride for the baby and handler, although I'd prefer a fixed/pivot wheel option. It's hard to describe but to adjust the seat you pull a cord on the back side of the seat. I love this feature so much that strollers without rotating canopies are deal-breakers for me. 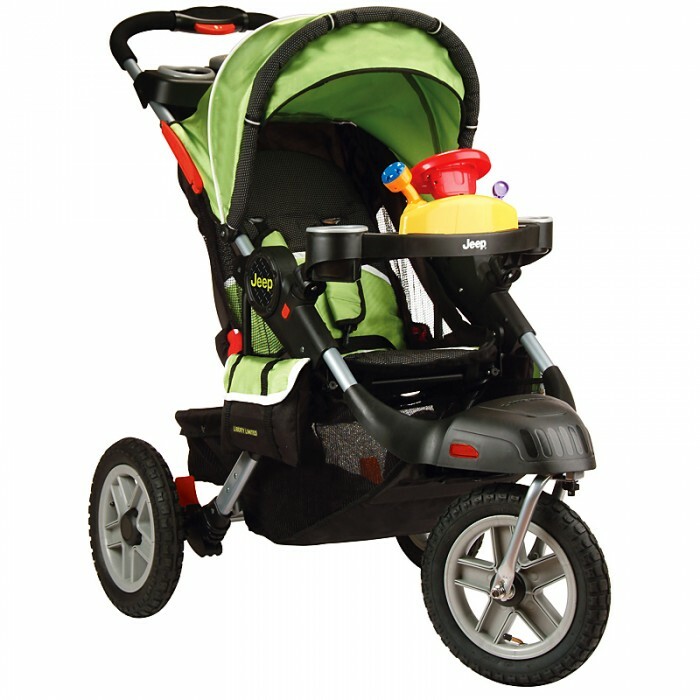 - Smooth ride, easy to push when running and even walking. Stroller looks beautiful and is easy to put together but the fabric quality is cheap!!! Love my new jogging stroller. Really great stroller, my daughter loves it and so does my granddaughter. I bought this stroller and LOVE it! Most important of all, my grandson LOVES riding in it!. Works perfectly and my 14-month-old loves it! My wife and I love this stroller. Already used sometimes ran 10 miles and I love it. Other than that it's great, baby loves the fact the the seating area is very airy, and she loves to fall asleep in it. She says it works great and she loves it. 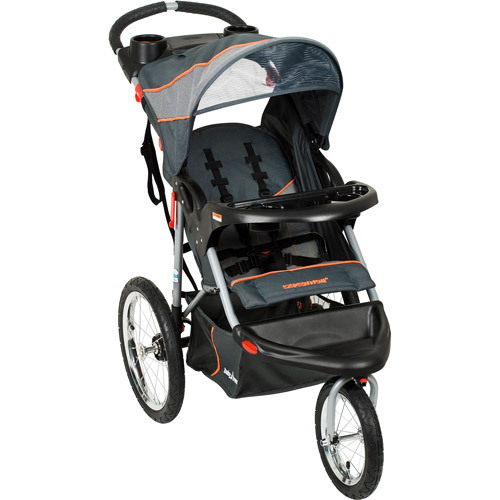 I ordered the Schwinn Free Runner Jogging stroller and I'm loving it! The jogger arrived ahead of schedule, was easy to assemble and looks great. Easy to assemble, light, and made very well. It's easy to maneuver once you get going, and although the alignment isn't always perfect, it's easy to adjust. The large wheels made traversing over gravel, bumpy terrain very easy. The adjustable sun shade works well. Taking the wheels off (which is pretty easy) helps conserve a lot of space. I can shade him from the sunlight with the adjustable shade and it's easy to fold up and store. I bought this jogger after having a better quality jogger. My 43 pound daughter fit in it nicely with a little wiggle room to spare. I highly recommend this stroller for tall people. We looked for something sturdy and nice looking and really hit the jackpot here. It'd go left about 3-4 feet for every 10 feet traveled. The item arrived in a badly beaten up box that was clearly not new. As noted by other reviewers, the front wheel of this stroller veers hard to the left. Just don't put nice shoes on them cause their feet will hit the tires and rub and/or leave marks. Sure enough, once assembled, this stroller pulled hard to the left.